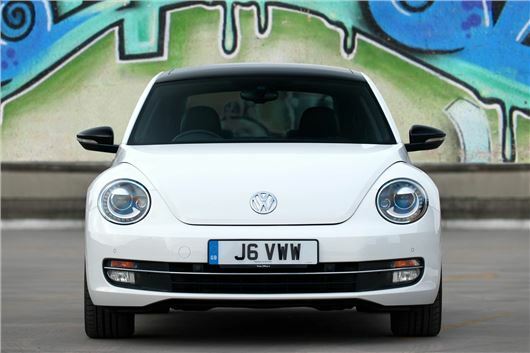 VW is cutting the price of all Beetle models by £2,000 and offering attractive finance offers on Beetles and Ups for 64 registration. £2,000 off all Beetle models includes hatchback and Cabriolet together with competitive finance on Solutions, Volkswagen Financial Services’ personal contract plan, from now until the end of the month. For the Up, Volkswagen Financial Services Solutions PCP offers a £500 deposit contribution+, one year’s free insurance (for some drivers), and monthly repayments over three years of £99 per month* for the Take up! 1.0-litre three-door model, at 7.6 per cent APR representative. When purchased on Solutions, customers will also be offered three years or 30,000 miles fixed price servicing for just £199**. For details of Volkswagen’s range of cars or to locate your nearest Volkswagen Retailer, visit www.volkswagen.co.uk. +Available when purchased on Solutions personal contract plan, excludes Take up! models Further charges may be payable if the vehicle is returned. Retail Sales only. 1Payable as first payment 2Payable with optional final payment. ^4.4p per mile excess mileage charges apply. Available to over 18s. Offer available for vehicles ordered by 30 September 2014 from participating Retailers. Subject to availability. Indemnities may be required. Terms and conditions apply. Offers are not available in conjunction with any other offer and may be varied or withdrawn at any time. Volkswagen Finance, Freepost VWFS. **Fixed priced servicing available when purchased with finance. Suitable for new vehicles up to 90 days from date of registration. Covers routine servicing for 3 years or 30,000 miles whichever comes soonest. All cars must be set to a time and distance service regime. Additional work, including wear and tear, is not included. Terms and conditions apply. ^^One year’s free insurance is available from Volkswagen Insurance on qualifying new up! models registered by 30th September 2014 for drivers over 21. Free insurance offer excludes Northern Ireland and Take up! models. Other eligibility criteria apply. Go to insurewithvolkswagen.co.uk/up! for full terms and conditions. Volkswagen Motor Insurance is sold, underwritten and administered by Allianz Insurance plc.